I don't think I could live in a world without chocolate. It is one of the most comforting things I know. Sometimes a square of chocolate is better than a warm hug on a cold day, a block of chocolate can help one drown their sorrows. It is the thing I reach for when there are plenty of other 'healthy choices' in the fridge or pantry, and what I crave when there is nothing else to eat. So why on earth would I say vanilla is sometimes better than chocolate? It was a self-declared 'Experimentation Sunday'. 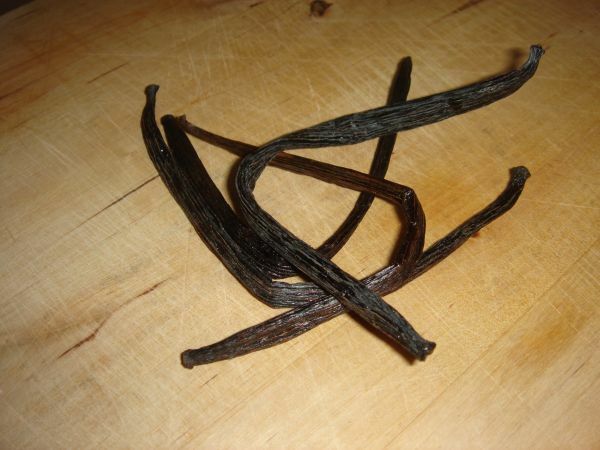 I had a jar of vanilla pods (a sweet bargain I probably will never find again - 12 pods for $4) and a Christmas magazine (a little late, I know) where I found a recipe for vanilla syrup. 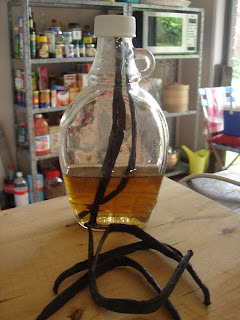 Now I pay at least $7 for vanilla extract and $14 for vanilla bean paste, so imagine my joy at being able to make my own vanilla concoction (with possible potential for use in baking) for nix? My intentions for this syrup were not pure, but indeed had purpose. Yes, dear friends, this syrup was destined for a very strong, very vanilla and very velvety smooth Martini. I can hear Martini purists getting all squeamish and wanting to hit me over the head with their Cocktail Bibles and I can probably hear you cussing and swearing at me for having the hide to call a 'Cocktail' a 'Martini'. 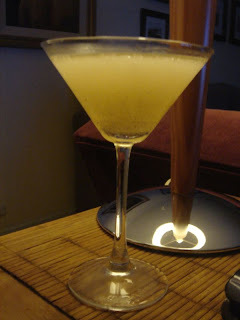 Well this is my blog, my drink and I like calling it a Martini. Call it what you will, it is a rather potent but smooth and deliciously syrupy-sweet drink. Firstly, here is the recipe for the Vanilla Syrup. Place 1 cup of caster sugar, 1 cup of water and 2 split vanilla pods into a saucepan. Set heat to medium and stir with a metal spoon until the sugar becomes dissolved. Let the mixture come to the boil and simmer gently for 5 minutes. The syrup will thicken slightly. Allow to cool completely and pour into a sterilized glass bottle (making sure you add the vanilla pods as well). Makes 1 cup. Fill a cocktail shaker with ice and pour over Vodka and vanilla syrup. (Wave a bottle of Vermouth over your cocktail shaker to ward off any evil Martini Spirits). Shake your booty vigorously along with the shaker and strain into a chilled Martini glass. I would love to think I could convert aficionado's of the Mud Slide with my sophisticated alternative. I still have some syrup left from my weekend of indulgence which I plan to experiment with by using in place of vanilla extract in my baking. I also plan to 'recycle' the vanilla pods for my next batch of syrup. I will be sure to post my results. Well yes, my first blog since Christmas this may be, however it does not mean that I have not been cooking and writing. Still, it is nice to know that there are people out there who read me and *hopefully* miss me. Vanilla might be tasty, but it's NEVER better than CHOCOLATE! Isn't that, like, Cooking 101!? Rule #1: There is Nothing more important than Chocolate (not even veggies).